Today at 1pm in Cardiff city centre we held a demonstration in solidarity with the hunger striking members of CCF and their friends and families. We handed out flyers explaining their situation and demands while shouting chants in English and Greek. After the demonstration we hung a banner in the city and scattered flyers from the roof. Strength and complicity to CCF and their friends and relatives. *we will send pics soon. 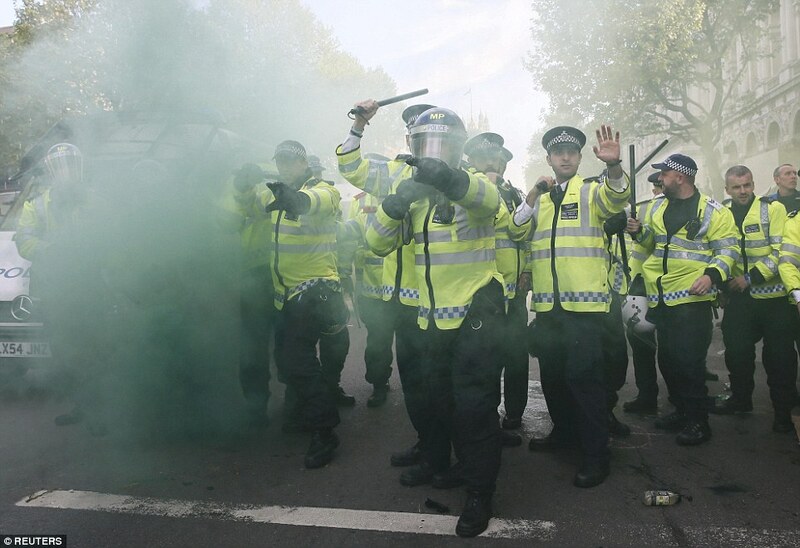 The last trial of the people arrested at last year’s NATO protests in Wales is due to be played out in court next Wednesday in Cardiff. This time the police and CPS are trying to stitch up someone up for assaulting an officer. A demonstration is planned outside the Cardiff Magistrate’s at 9.15am on 4th February. Almost all of the other people arrested at the protests against NATO and the DPRTE arms fair have had their charges dropped. The cases demonstrate, once again, that the cops will make arrests and harass demonstrators any way they can with the aim of stamping out resistance. They also show the urgent need for collective solidarity for those experiencing police repression. Monday 1st September – Sabcats anti-austerity action at Newport jobcentre and army recruitment centre. Wednesday 3rd September – Activists hand in a demand for the arrest of NATO leaders to police in Newport, based on evidence leaked by Chelsea Manning of war crimes. 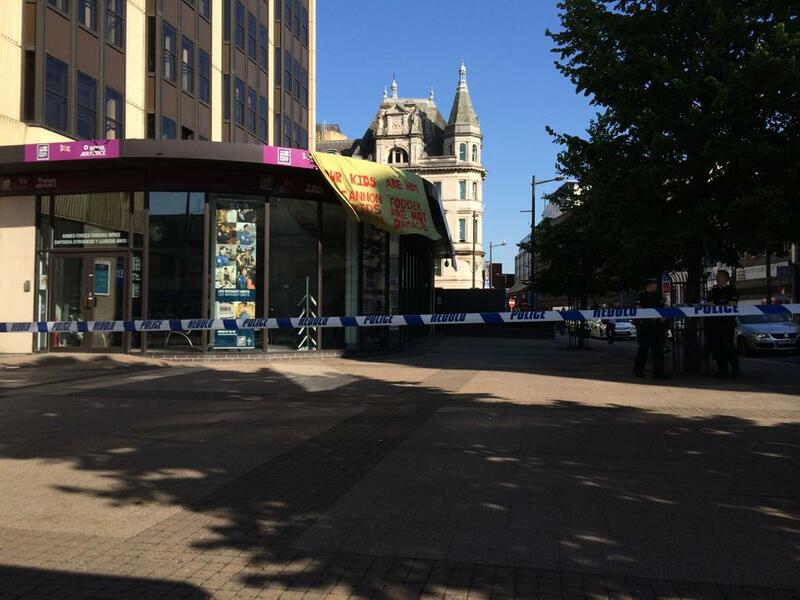 Saturday 6th September – Solidarity demonstrations outside Newport Magistrates Court in support of Barclays occupiers. Last week we saw a diverse struggle against NATO in Cymru. Marches against NATO in the streets of Newport and Cardiff; actions against the forces driving war in the banks and the securitised zones; workshops and discussions at the camp about connected issues from Gaza to police repression at the camp; people spreading the word in a hundred different ways, from conversations with locals, to the camp, to the web. But the struggles against capitalism and militarism are not a one-day, or even a one-week, event. 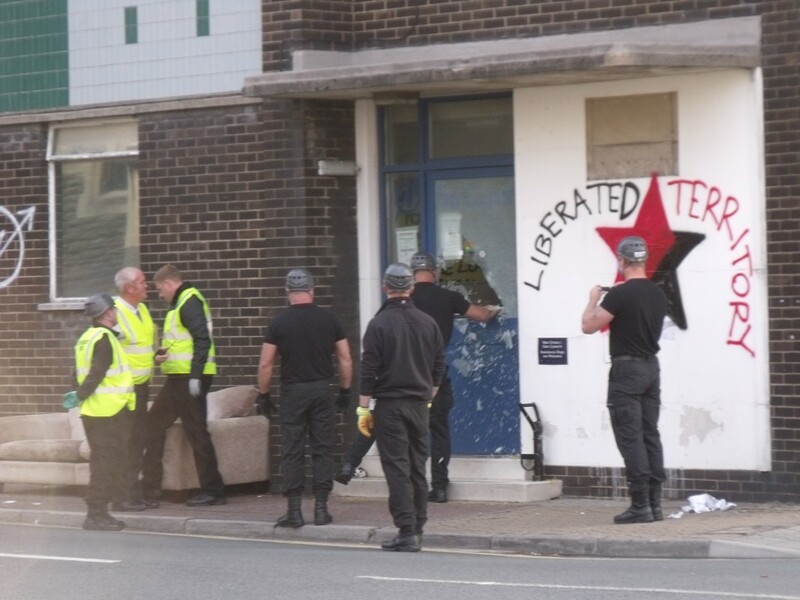 The actions taken this week by Stop NATO Cymru, the Anarchist Action Network and other organisations are a small part of building up a movement capable of bringing about radical change. So, when we look back, does it make sense to ask whether we “succeeded” in the week of action? We think it does. If one more mind went beyond the distortions of the mainstream media because of what we did, then yes we ‘succeeded’. If one more pair of feet was spurred onto the streets by what we did, then we succeeded. And if one more pair of hands joined with ours, yes, we succeeded. In the coming struggles, those hands will again pick up the tools to take action, until the last drone is smashed. We hope to see you there. We hope to see you there. If you would like to be a legal observer contact us at stopnatocymru@riseup.net . You can also contact us by that email address for any additional information regarding the demonstration. From Cardiff to Gaza – tear down their barrier! Whilst they are in no way equivalent, we are mindful of the daily plight of the Palestinian people, hemmed in by giant walls that prevent them from accessing sufficient provisions, medical care or shelter from the prolific murderous Israeli attacks that have recently claimed thousands of lives. We stand against all those states and corporations which would seek to profit from human misery, division and securitisation. Meet us on Sunday, 31th August, at 3pm at the Nye Bevan statue in Cardiff (west end of Queen Street, opposite the castle) to make our feelings known. Bring Palestinian flags and banners. All week: action camp near Newport, with gigs, workshops, skillshares. The main info-point for further details during the week will be at the camp. Full details can be found on the camp website. 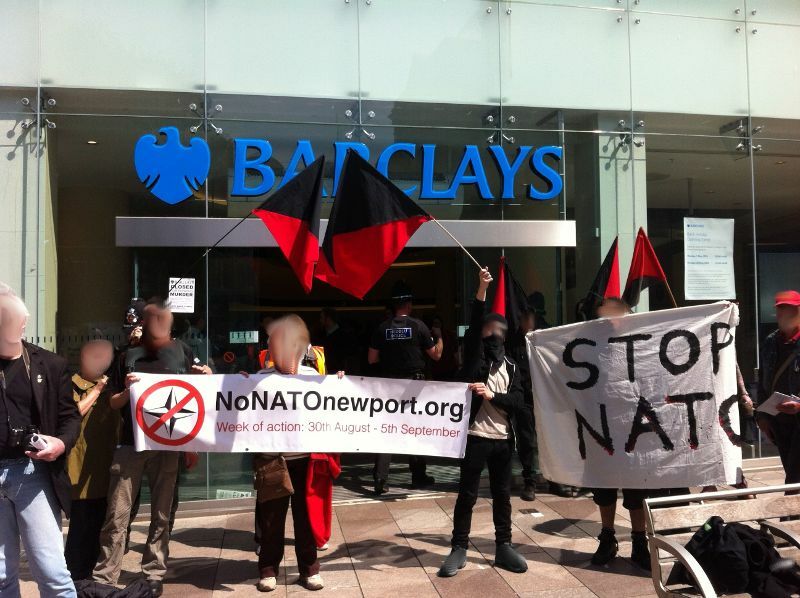 Sat 30th Aug: Radical bloc will join demo against NATO in Newport. On the morning of Friday, July 25th, supporters of Stop NATO Cymru took action in London and Cardiff, locking themselves to the front doors of missile developer MBDA, occupying the HQ of arms company Airbus Group and closing the Armed Forces Careers Centre in Cardiff by occupying the roof. This was part of an ongoing anti-militarist campaign in the run up to September’s NATO Summit in Newport, targeting all institutions which perpetuate violence on a global scale. MBDA is jointly owned by arms companies Airbus Group (37.5%), BAE Systems (37.5%) and Finmecanica (25%), companies guilty of providing arms used by Israel to bombard communities, demolish hospitals and murder innocent children in schools. Palestinian solidarity activists stood with us against these monsters, with Israel having used British bombs on playing children, family homes, schools, independent journalists, rescue vehicles and hospitals in the last week alone. 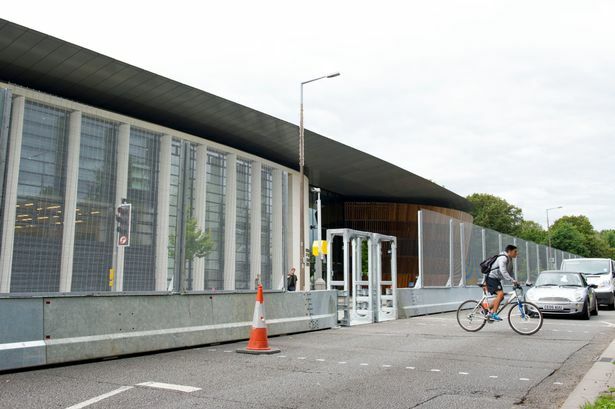 In solidarity with Stop NATO Cymru, anti-miltarist activists from Stop the Arms Fair entered the lobby and picketed the entrance to the London HQ of Airbus Group (aka EADS). Airbus Group is a major profiteer of war. They manufacture jets, drones (including some with nuclear warheads) and surveillance technology. They are the second largest arms producer in Europe, with investments in authoritarian regimes such as Saudi Arabia, UAE and Kazakhstan. Airbus has recently announced new contracts worth £50mil, and have urged the arms industry to take ‘full economic advantage’ of the NATO Summit. The summit is an opportunity for them to showcase their killing machines and blood-stained business through NATO procurement. Stop NATO Cymru opposes the NATO war machine, arms production and the murder of anyone for corporate profit. When the rich declare war, the poor die. Earlier this month the British Army launched a recruitment drive entitled ‘More Than Meets the Eye’, aiming to dispel myths surrounding life in the forces, boost their falling recruitment figures and secure the flow of “a new stream of young blood” as head of recruiting, Major General Chris Tickell, so aptly put it. They are right about one thing, there is more to life in the army than meets our eyes – more to what the media, charities and the state show of the idealised soldier. Waves of forced redundancies are leaving thousands unemployed, many of them young people, promised adventure and reward at the recruiting office before being spat into the jobcentre, often injured, with thousands wounded over the last decade. Even those who keep their job are constantly exploited by the state. The fact is that every individual within the armed forces – from the musician to the infantryman – is part of an effort to further the state’s expansionist agenda. In Afghanistan, war for oil saw the deaths of almost 4,000 coalition troops and an estimated 20,000 Afghan civilians killed to bring NATO’s version of democracy to the Afghan people. Now we see conflict flaring in Ukraine, with British companies having armed the Russian dictatorship, America throwing its weight behind a neo-Nazi backed government and the people of Ukraine and the world suffering the consequences. We took action to show that we will not stand by and watch ordinary people suffer in the wars of the wealthy. We are anti-militarist, opposed to states, their armies and the world that creates them. When NATO brings its circus to Newport in September, we will make our feelings known. NATO is the militarist juggernaut that encourages military spending in times of austerity, stokes the flames of conflict in places like Ukraine and represents the armed wing of capitalist exploitation. In spite of the power behind NATO – and all militarist institutions in a world of government by violence – we will keep up our fight on the streets, doing all that we can to bring change, until every gun is cold, every bomb is dead and every cage is empty. Stop NATO Cymru is a group initiated by local activists to mobilise against the NATO summit. 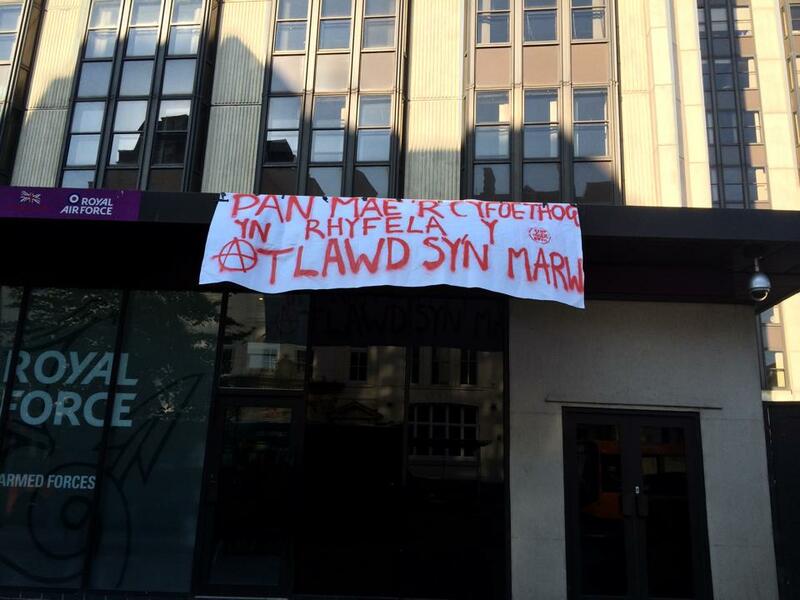 Stop NATO Cymru joined with the Anarchist Action Network as a group with the same fundamental principles and as a group with the experience and skills gained from the anti-G8 mobilisation in 2013. These principles are based on the PGA Hallmarks, we are overtly anarchist and support a diversity of tactics. The Anarchist Action Network is working with Stop NATO Cymru to mobilise against the forthcoming NATO summit. This is the last National Convergence before the summit – come and join the mobilisation! All welcome except cops & journos. Between Saturday August 30 and Friday September 5 the leaders of the so-called North Atlantic Treaty Organisation (NATO) countries will be inflicting themselves on Newport- a little town in South Wales. Hiding themselves behind a wall of their thugs. Check out this newsletter about making life difficult for them from anarchist action network and stop nato cymru. Saturday 19th July 11am -5pm in Newport, South Wales at the Community Space Partnership, 128 Lower Dock Street, Newport, NP20 1EG. Stop NATO Cymru is a group initiated by local activists to mobilise against the NATO summit. Stop NATO Cymru joined with the Anarchist Action Network as a group with the same fundamental principles and as a group with the experience and skills gained from the anti-G8 mobilisation in 2013. The Anarchist Action Network is working with Stop NATO Cymru to mobilise against the forthcoming NATO summit : Sat 30th Aug – Fri 5th Sep. This is the penultimate organising meeting before the summit – come and join the mobilisation! On Mayday 2014 Anarchist Action Network is calling for anarchists to unite in One Common Struggle. We are calling on you to join fellow anarchists and remember the victims of the system’s oppression, take action against the symbols of the state and capitalism and hold events highlighting the need to struggle for a better world. May Day was first celebrated as a day of international workers’ solidarity in 1890. It was called to commemorate the murder of four anarchist workers in Chicago by the US government.